Protect yourself without weighing yourself down with these foam-and-cloth pads. Snug-fitting, lightweight design may be worn over or under trousers. Slip-on, slip-off, elastic band. 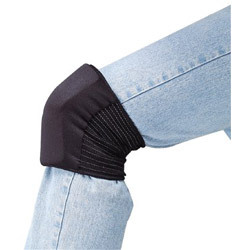 Elbow/Knee Pad Type: Knee Pad; Size Group: One Size Fits All; Closure Type: Slip-On; Material(s): Nylon/Foam/Elastic. Knee Pads from Allegro! 410 In Stock today.